If you have any questions or want to enquire about dates, use our form to contact Alison or see their website for more information. 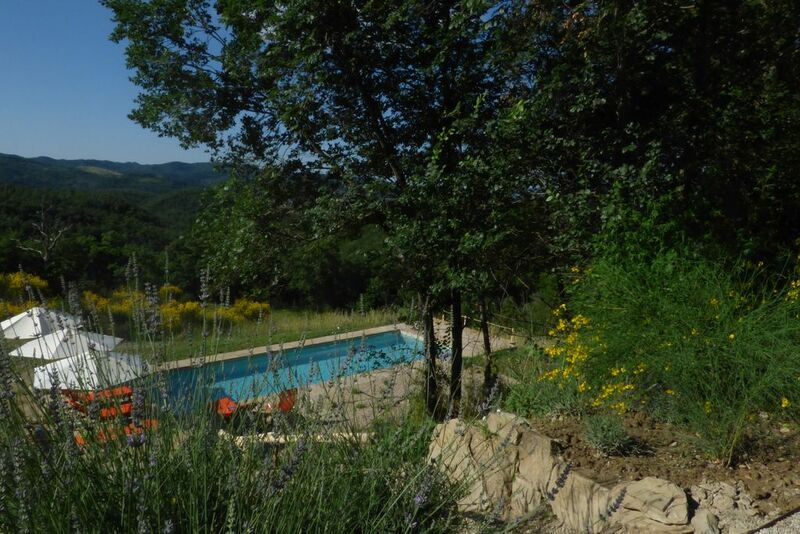 In a hidden pocket of Umbria find a gently revived old stone house with lush views. The owners resisted the temptation to over-restore and have accomplished a serene simplicity: reclaimed doors and terracotta floors still bear some scars of old age. Downstairs an open-plan area invites you in: a plump cream sofa by the an original fire, pots and pans hang in the kitchen, and a large restored table. Fling open French windows to let sunshine flood in. One bedroom is downstairs with doors to the garden, upstairs there are two more doubles; all are beamed, restful spaces dressed in white; big bathrooms have Neal’s Yards goodies. There’s an extra sitting area with a wood-burner and movie projector too. The saline pool is bordered by lavender, there’s a shaded area for al fresco eating, views are dreamy; there are neighbours so you feel nicely rural not isolated. A housekeeper greets with a basket of essentials including bread, wine, pasta and homemade sauce. This is farming and vineyard country – there are walks and horse riding, but also tennis and a thermal spa. We had an absolutely magical stay in this fabulously comfortable and fun house. We spent hours in the pool, enjoyed the home cinema in the evenings and star gazing from the roof terrace. When we were able to tear ourselves away from the house and pool we explored the beautiful country walks that are all around the house and lead to beautiful villages or just through the hills. Citta di Castello - only ten minutes drive away - is a lovely small town with impressive churches and lots to discover around every corner. We couldn't have asked for a better holiday and we'll be booking for next year! Our second visit to beautiful Casa Pieratti. Over the past year the gardens have flourished and the poolside dry garden is looking wonderful. It's so peaceful here it's hard to tear yourself away but we did manage a trip to the bustling Saturday market in Città di Castello and a visit to the Burri collection in Palazzo Albizzini. The rest of the time we spent lounging by the pool, swimming, reading and enjoying the tranquillity and wonderful views. So many butterflies and amazing hummingbird hawk-moths hovering over the dry garden. Just idyllic. Casa Pieratti is a gem, whether you use it as a base to explore the cities of Marche and Umbria or just to relax in profoundly peaceful, beautiful countryside by a generous-sized pool set in a lovely garden. The house itself has been lovingly restored retaining the charm and dignity of a traditional farmhouse but with all modern comforts. Highly recommended. We had a fantastic stay at Casa Pieratti. The house is beautiful and very well equipped and the pool is quite fantastic, with stunning views over unspoilt countryside. A fairly remote spot, which suited us perfectly, though there are good restaurants within a short drive. We will be back again for sure! What a glorious place. I have stayed in many rentals over the years and this really is the only one where you can't fault a thing taste-wise. It is exquisitely and lovingly set up for your holiday. Everything is elegant and comfortable and you can see that it is a real home, made with love. Only the best quality beds, sofas, sheets, equipment. The pool is lovely - saline - with a completely uninterrupted view. The planting is so pretty and the people who look after the house are so friendly, helpful and nice. Highlight: Lying in the bath and watching a projected movie with fantastic sound! I've visited this part of Italy many times over the years and it's rare to find a real gem like this place. It has everything that I need for a relaxing holiday, not least the pool and the amazing views. The rooms are all airy and large, the beds are excellent and the bathrooms are well up to scratch. Everything you need is either there already or is easy to get in the nearby town. All in all, I loved it and wouldn't hesitate to recommend - the cinema is a nice touch as well!! Beautiful old house, lovingly restored with art director's eye for rustic simplicity, has breathtaking views over surrounding countryside. Well equipped kitchen. Comfy beds with Egyptian cotton linen. Rooms, including en suite bathrooms, are large and airy. Clean saline pool, bordered by lovely dry garden. Plenty of recliners and parasols by pool and in herb filled garden around the house. Al fresco dining table has wonderful view. Roof terrace for sunbathing/stargazing, home cinema, good wifi. Peaceful base for exploring the region or just chilling out. Property manager Roberto very helpful. Our local housekeeper will greet you and show you the house and pool. There' s a good restaurant 4 minutes away. We also know a great local chef who can come and cook for you ( Classic Umbrian also vegetarian or vegan). Takeaway Pizza is a 5 min drive. The nearest village with restaurant and bar is a 5 minute drive. The historic market town of Citta di Castello is 15 mins down the hill. Here there are plenty of bars, restaurants and supermarkets. The International Chamber Music festival is early Sept. There are lots of great places to visit including the medieval hilltop towns of Montone and Anghiari ( 30 minute drive). Montone hosts Terry Gilliam’s open air film festival in the town square around the second week of July. In Sansepolcro, the spectacular Palio takes place the first weekend of September. The truffle festival in Citta di Castello is in early November. The Montone truffle festival is at the end of October. There are wonderful walks in the area. Nearest Tennis ( clay and indoor ) is a 15 min drive. There's also a Terme nearby for massage/treatments. The nearest kids playground at Sasso, 10 mins away, has climbing frames, wild swimming and little waterfall. You are less than an hour from Perugia, Arrezo and Gubbio. Arrezo has a huge antique market at the beginning of each month. Siena is less than 1 hour 30 minutes away, Florence is less than two hours. The nearest beach at Fano, is a 1 hour 20 mins drive.